In 2013, Muncie Dentist Greg Pyle began implementing the TruDenta® pain relief system to treat patients experiencing issues with recurring headaches and migraines. The TruDenta® system was born from the Sports Medicine Industry and much research was put into developing the unique pain relief system. TruDenta® is a drug-free, needle-free, and pain-free system to provide long-lasting pain relief. The life-changing, therapeutic treatments have been 95% effective in patients suffering from the painful symptoms of chronic headaches, migraines, TMJ/TMD, and many other painful conditions. 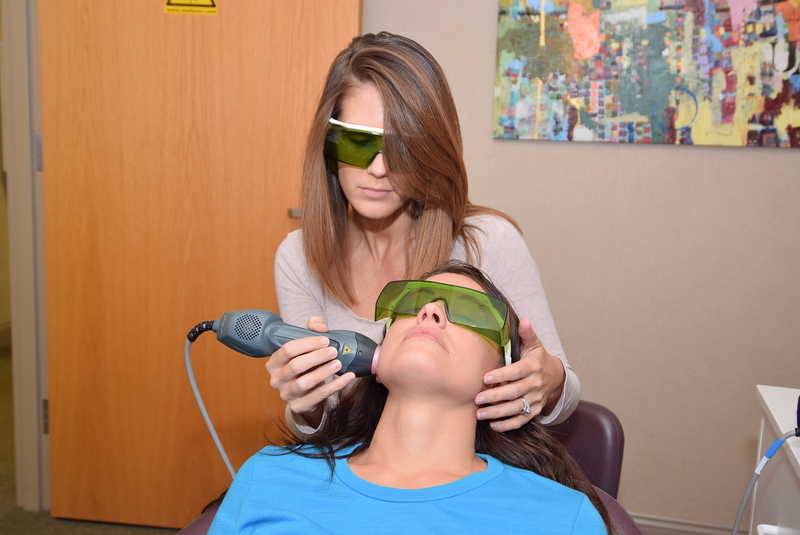 Krista Barnes applies a Trudenta® cold laser treatment. The cold laser is painless and is one of the methodologies used in the Trudenta® system. After some preliminary testing, patients are assigned a level, ranging from 1-4, depending upon the seriousness of their headaches. A specific TruDenta® treatment plan accompanies each level. Level 1 patients include patients whose headaches are really short-term. The patient may have only experienced headaches for a few months. Level 2 patients are somewhat new to headaches. For them, headaches are an acute problem. The patient may have had headaches for about a year. “In lay terms, if noise bothers you— if you have to shut off all light—if you have to go into a dark bedroom and need total quiet to get rid of it, it’s probably a migraine,” said Dr. Pyle. Dr. Pyle recommends those with headaches that are considering the TruDenta® system, try to have an open mind. Level 4 patient testimonial who went through and finished Dr. Pyle’s program. Broadcast on WLBC, 104.1 FM — WERK, 104.9 FM—and BlakeFM, 96.7. Click below to listen.